I was having lunch with my cousin Jane last week and we were talking about the kinds of books we like to read and we both agreed that we don’t need closure in a novel, that in fact, we prefer ambiguous endings. Life goes on and there’s rarely closure and it’s satisfying to find those qualities in a novel. I think that’s why for me, reading mysteries is like eating candy (not a good habit). When you’re done reading (or chewing), the thrill is gone and you need another one to stoke your addiction. 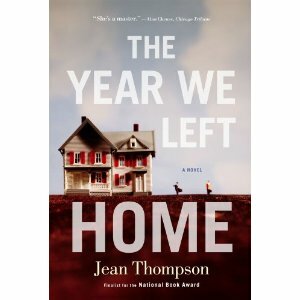 My most recent favorite novel with an ambiguous ending is The Year We Left Home by Jean Thompson, coming out in May. Thompson follows a Midwestern family for 30 years, particularly the children who come of age in the early 1970s. Thompson’s descriptions of people and situations are fabulous: a disliked brother-in-law is “an undigested lump” in the family. The chapters are like punchy short stories, filled with character, incident, and the economic and social changes that reverberated in the lives of farming families in the Midwest. Nothing in these characters’ lives can be predicted, but everything feels just right. At the end, there’s sadness, redemption, and some new beginnings, leaving us with lives we recognize as our own. This entry was posted in 2011 Fiction, Families-Fiction, Fiction. Bookmark the permalink.